congatec – is demonstrating the power of hard real-time communication over Gigabit-Ethernet at electronica 2018 (hall B5, booth 402). 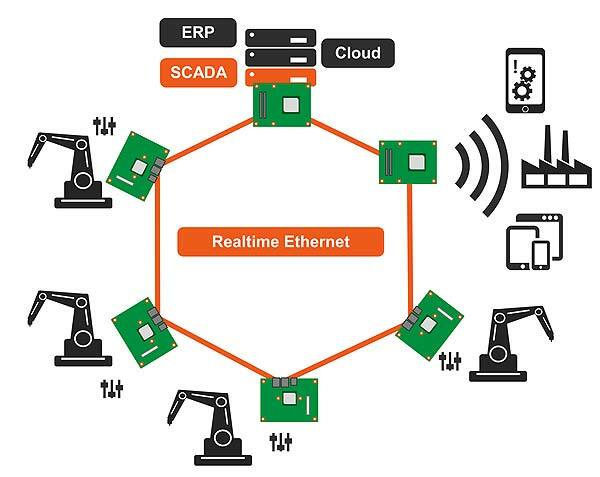 This demonstration shows that real-time data – the base for most Industry 4.0 installations – can still be transmitted in time even when utilizing a heavily loaded Ethernet connection. Based on Pico-ITX boards with Intel Atom E3900 processors, it integrates the Time Sensitive Networking (TSN) protocol in compliance with the IEEE 1588 Precision Time Protocol specification. Designed to ensure the real-time capability of Ethernet connections, it also safeguards the real-time capability of higher layer communication protocols such as DDS or OPC UA and other industrial Ethernet protocols. congatec runs the live demo on multiple conga-PA5 Pico-ITX boards which transmit a high resolution video file as base payload for the Ethernet and additionally generate and transmit the real-time critical data in parallel. In the demo, the IEEE 1588 Precision Time Protocol Synchronization can be switched on or off via a digital switch to measure and illustrate the difference in communication behavior. The IEEE 1588 Precision Time Protocol enables high-precision synchronization of distributed devices and fog servers via Ethernet. The maximum jitter can decrease to the high-precision nanosecond range. To comply with IEEE 1588 features a software-definable pin for each Ethernet interface, which is part of all current congatec Computer-on-Module implementations. This physical pin can be configured as an input or output and is controlled by the corresponding Ethernet controller, which enables the implementation of a hardware-based IEEE 1588 timing protocol for powerful real-time applications. The fanless embedded platform is based on the Pico-ITX board conga-PA5 with Intel Atom processors and can also be designed with the COM Express Type 7 modules based on latest 16-core Intel Atom processors (codenamed Denverton). Customers benefit from virtualized, fanless embedded server platforms with up to 16 cores, enabling them to provide highly flexible, real-time edge services as well as Industry 4.0 and M2M/IoT services of all kinds. In addition, dedicated infrastructure components such as firewalls, load balancers and routing systems can be standardized using software-based solutions and integrated into embedded fog servers. All of this helps OEMs increase the agility and cost-effectiveness of their communications infrastructure. Customers can request the best practice design from congatec and use it as a blueprint for their own embedded Industry 4.0 and fog server designs. The supported IP includes the software configuration and API for enabling and disabling the IEEE 1588 Precision Time Protocol Synchronization.